WARNING - I just installed some Taranis gimbals on another 9x radio. I was surprised that the Rudder stick wouldn't move to the right even after calibration. Found the reason, 2 of the wires were swapped on the little trim board at the factory, and then corrected on the stick itself. So, the colour code for that stick wasn't the same as all the other sticks. This seems to be a rare event though. If you notice the same problem, this is probably the cause. Here is a picture. Here are some pictures of my 9Xtreme installation. Some of the pictures were copied from other posts/threads. 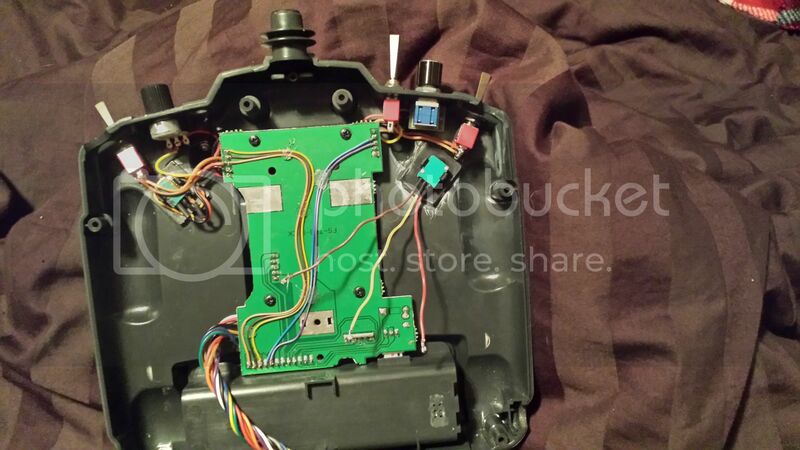 The one from the switch board without the protection diode, and 2 pictures of the gimbals. I wrote some comments on the pictures. This was the diode I used, But any Schottky diode rated at 20V / 3A should do the job. this one is rated at 40V / 3A. Just a little note here. Some people are cutting the backplate to make the Taranis gimbals fit when installed the same way as the 9X gimbals were.. Well, there is absolutely no need for cutting the backplate (and a few important tracks with it that you will have to trace and fix) if you install one of the gimbals inverted as shown in this little tutorial. 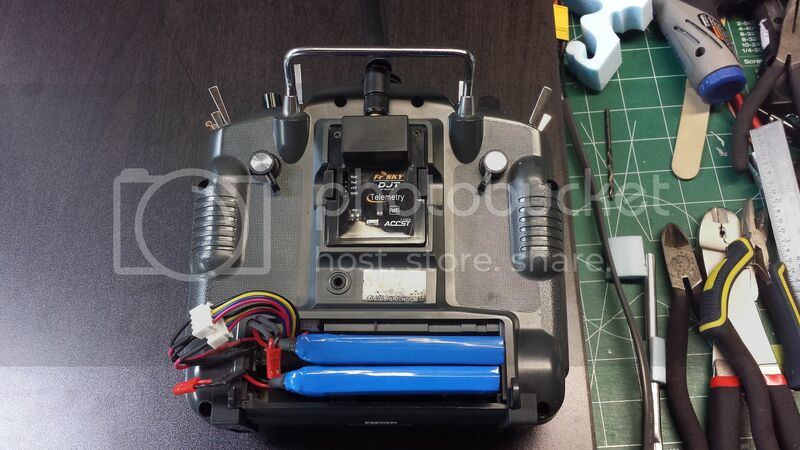 As you will see, you will only need to cut/grind 3mm of plastic on one of the gimbals only.. Very easy.. Thanks to bob195558 for this picture. Replaced ELE switch with a 3 position switch. See picture above and picture below (Green Text). I have to say it's a very good and clean installation. Great job. Thanks. Will add the haptic when I receive the motors..
Perhaps I'll make that mod. Enviado do meu Galaxy S6 edge através de Tapatalk. Thankyou jhsa! Beautiful photos and very clear and concise annotations. This is like a "wiki" installation guide. Good that you find useful. After I also installed the haptic, I will put all pictures inside a zip file and upload it so people can just download all of it in one go.. I think the most useful might be table I have made for the Taranis gimbals connections. If you have non amplified gimbals and connect them as in the table, You won't have to invert any of the stick in the firmware.. Easy. You might try the test version I just posted here: viewtopic.php?f=126&t=7751&p=103194#p103194. You might have 4 push buttons available! (Can you make that thread 'sticky'?). How would they be incorporated into the mixes and firmware? You just set the signal in use for them in the hardware menu, then they appear in the lists of switches for use, just after the TRN switch. MikeB wrote: You might try the test version I just posted here: viewtopic.php?f=126&t=7751&p=103194#p103194. You might have 4 push buttons available! (Can you make that thread 'sticky'?). Mike, I think it is done. Can you please confirm that it is sticky now? You just made my day, thank you so much.. Downloading the test version right now.. I confirm PB3 and PB4 are also working. This firmware is getting more and more powerful by the day..
Guys, I just added a warning to the first post about something that happened to me while installing the Taranis gimbals on another radio..
jhsa wrote: WARNING - I just installed some Taranis gimbals on another 9x radio. I was surprised that the Rudder stick wouldn't move to the right even after calibration. and then corrected on the stick itself. So, the colour code for that stick wasn't the same as all the other sticks. This seems to be a rare event though. If you notice the same problem, this is probably the cause. Yes! I have had it happen to me on some 9x radio's also. The Chinese seem to be colorblind when it comes to wire colors on the 9x radios. Last edited by bob195558 on Mon Dec 14, 2015 11:43 am, edited 1 time in total. Yes, that's true, and there is no child labor laws in China too. That isn't true. They do have child labor laws. You have to be 16 to be employed in China. Of course, murder is illegal here but it happens... so I can't say if their laws are widely respected. I also did the Taranis gimbal upgrade, but I trimmed the backplane instead of flipping the throttle. Added sliders as well, not functional yet but I can wire them to P1/2 if needed in the meantime. Just tested code to handle one extra pot on the 9Xtreme. Three more should be possible, but I need to do rather more work than adding one! Grantman wrote: I also did the Taranis gimbal upgrade, but I trimmed the backplane instead of flipping the throttle. The other way, you just need to trim 3 milimeters of plastic, done.. I did it that way because I liked where the wiring ran more than I liked the acre of backplane. The tracks were traced before the mod (some of us actually plan these things out) so repairs were a no brainer. I might actually replace the backplane with one of my own etchings so I have no reservations about cutting it up. Ahh, that's something else But for most people is easier to install the gimbals as shown on the first post. Some people already cut traces they shouldn't when cutting the backplate.. That's why I mentioned it.. Sometimes we plan stuff, but at the end there is always something we didn't check.. It happens to me all the time..
Great mods Joao, well done.. The speaker is very good. Loud and very clear. One think I like is that covers only the area where the holes are. Which, as I've said many times, doesn't matter worth a lick. It could be rated for 100W but if we're only putting out < 0.5W then we're only putting out < 0.5W. Again, it is *rated* for 1.7W... that's the max it can output. The speaker is *rated* for 0.5W and that's the max it should handle. It is fine. There isn't a single gain setting resistor as it uses complimentary inputs. Effectively, there are two 130K resistances as the input ressitors, reducing these increases the gain. One is an actual 130K resistor, the other is, for historical reasons, a 10K resistor in series with a 120K resistor. The two resistances must be kept the same as each other. Thanks Mike, are they 1%? also what would be a good start value?